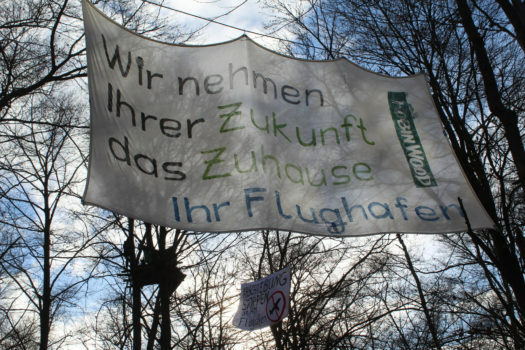 Plans to expand Frankfurt’s Airport’s third terminal and clear 6ha of mixed forest for the motorway connection have been put on hold by a over a month long now forest tree-sit occupation. Treburer Wald between Zeppelinheim and Möhrfelden-Walldorf Waldorf on the edge of Frankfurt is now a home to group of activists living in 3 platform and a treehouse connected by walkways with multiple banners bringing attention to the climate, pollution and noise impact of the airport. Originally published by Hambacher Forest. Treburer Wald Occupation joins Grow Heathrow in London and Zad at Notre Dame des Landes in France as direct action outposts blocking the constant expansion and support of airline industry and its mega-projects despite their impact on the climate. Constituting ver 8% of global warming effect and projected to double by 2040. Airports decimate and uproot local communities and detract from ground level public transportation, offering a way for upper and upper middle class to travel while decimating and uprooting local communities. The occupation is receiving quite a bit of local support with Sunday supporter gatherings and weekly Monday demonstrations in Terminal 1 of the Airport. The long history of opposition to the airport expansion started here in the late 70s and became the catalyst for German ecological movement with thousand blockading the roads and the forest. The airport struggle was suppressed with massive amount of police violence and brutality. However the movement still resurfaced with a Forest Occupation in 2008 and continues to this day at Treburer Wald. Treburer Wald Bleibt! Treburer Forest Stays! Next post: #Germany: Cops Banned Demos in Solidarity with #Afrin in #Cologne and #Duisburg. Come to #Wuppertal!